Well everybody here we are!!! This journey has gone so fast yet so much has happened. We're combining the last few weeks because as babies get past 30wks they start really growing and filling out which can make getting pictures more challenging. I want to thank the family who have been such great candidates and been everything we could have wanted! Thank you for sharing your pregnancy with all of us, so Sheri and I didn't have to have another baby. 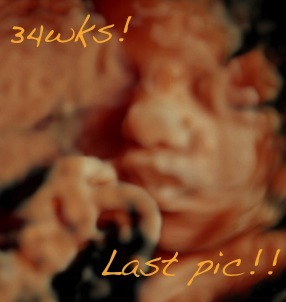 :-) We are going to post a newborn picture once baby is here so that you all can see how amazing this is! I can’t believe how fast time has gone by! This has been such an amazing experience and we are so happy we were given this opportunity. These past few scans flew by, along the way we saw so many more changes. 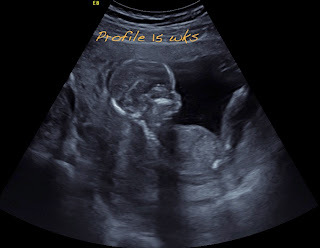 During the 31 week scan we got to see our baby girl licking my insides and then she made a funny face after. I think she really likes sucking on her toes or on the umbilical cord as we’ve seen her do this many times. I almost felt bad for her after she made that face because it almost looked like she was mad she couldn’t find her toes! 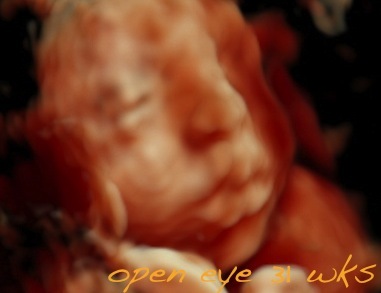 We also got to see her open her eyes which was pretty amazing! 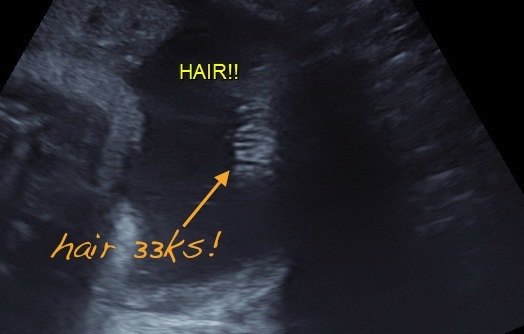 At 33 weeks we got to see her hair! 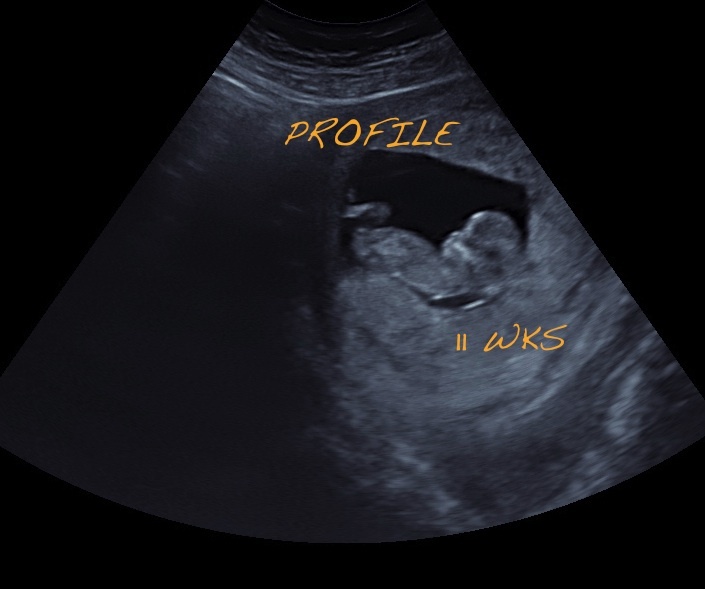 Well, we have been able to see a few little strands in the past but at this scan we could see it moving around in the amniotic fluid which was super cool, I’m excited she’s going to have a head full of hair right off the bat. Hopefully she keeps it all, her brother had quite a bit of hair but he went bald all over within a month so my fingers are crossed she keeps hers! At our 34 weeks scan you could tell she was defiantly running out of room, we got to see one last picture of her beautiful face before she is born! I am so anxious to meet her; it should be any day now as my due date is July 23rd. Thank you so much to everyone to watched our little princess grow from just a little bean at 9 weeks all the way to 34 weeks. It has truly been an amazing journey! There were times when I felt I would “be pregnant forever” and then there were times that it was going by too fast. 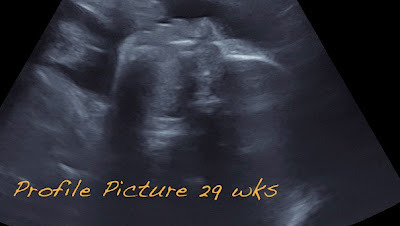 I am so thankful we have these amazing pictures to cherish and it has made this pregnancy that much more special! 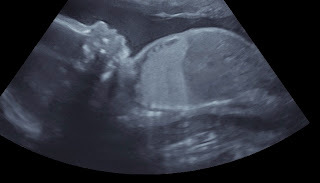 Thank you so much Jon for everything, I’m so surprised at how advanced technology is, it feels like we’ve already met her before she has even been born. Not only do we know what she’ll look like, I feel like we got a taste of her sassy little attitude as well J We’re so excited to share pictures with everyone once she gets here! Wow time is just flying by!! Here we are at 27/29 weeks already, it’s a bitter sweet feeling as I am so excited to meet our daughter but at the same time I’m really enjoying this pregnancy! 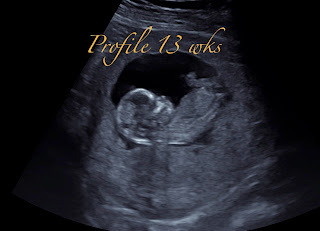 At the 29 week scan we were able to get some pretty good images of her as she finally moved into a different position. It’s amazing to see her face and different details already. She looks like she has chubby cheeks but I know in reality she is still on the smaller side! It will be really interesting to compare these images once she is born. Jon said she is head down so hopefully she stays that way. We’ve started rotating the bedrooms around at our house and we’re going to begin painting and setting up her furniture in the nursery as well. We’re almost in the home stretch now, only about 11 weeks left!! 25 weeks down and only 15 more to go! My boyfriend and I keep joking around that she is already running out of room since she seems to be so squished already! It’s again so amazing to see how much bigger she is getting. I feel like this week her face was much fuller in her lips and her cheeks than in the past. 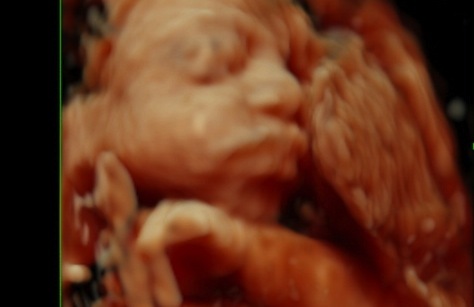 The picture of her snuggling up to the placenta is so cute to me! Her brother is a blanky baby and HAS to have blankets touching his face whenever he sleeps or naps and has been like this since he was born, he’s almost 16 months old now. 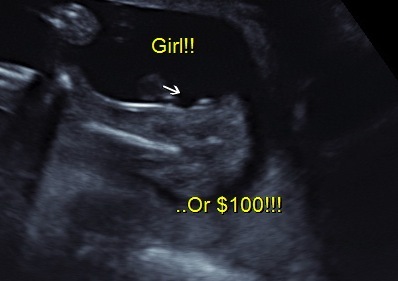 I’m guessing she is going to be the same! I’m definitely starting to see a lot of my son, my boyfriend and myself in her face but it still doesn’t beat the anticipation I have of meeting her! 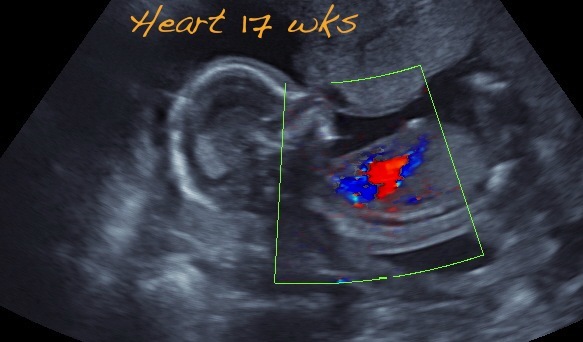 Also, the heart seems to have grown so much in just the past two weeks, it really makes me think how amazing pregnancy really is, that we can grow and make such strong and healthy babies! So back again 23 wks. This time the baby was in another transitional position so we got a few shots but not as much. That is totally normal and no big deal. Still amazing to see the growth! Heart Rate 136 bpm. For some technical info. 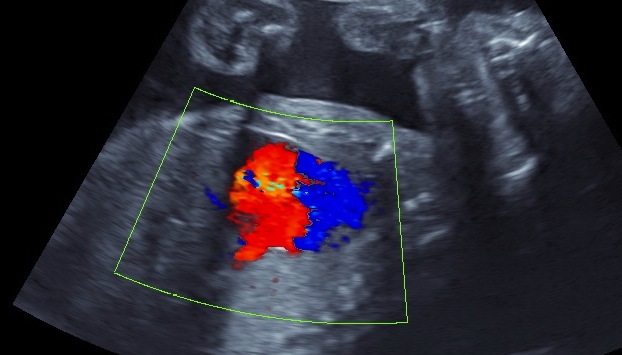 the baby is just about 11 inches and weighs nearly a pound. What a miracle so amazing each week to experience the development of this little girl. It was still super cool to see how much more she is developing and changing. I think one of the best parts now is to see how much bigger she is getting each time in her profile picture and how much more “baby like” her face is starting to look. The heart is looking much bigger now too! 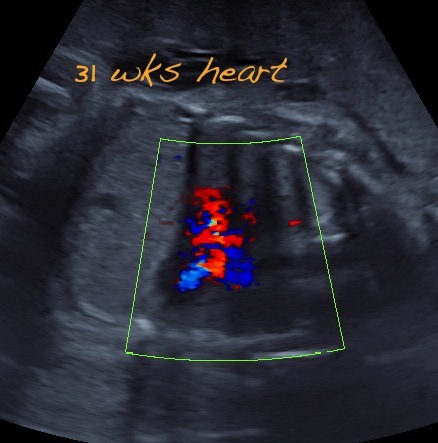 I still like to look back at the first scan of her heart and it looked like two little red and blue dots, it’s crazy how much more it has grown! Well, here we are again. Things are clicking along and the baby is now 21wks. Over half way done!! Heart rate was 151bpm. Woo hoo, more than halfway done, well only by a week but still J I’m getting very anxious to meet my little princess; I feel like this pregnancy is flying by but at the same time I feel like I’ve already been pregnant forever! Every pregnant woman feels this way at some point right?! I invited my mom to come with me to this scan since my boyfriend is out of town working. 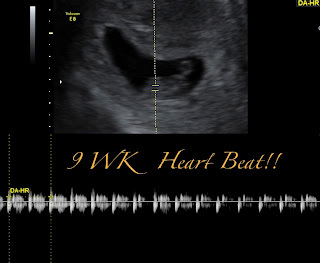 She was very excited because not only was she going to see her second grandbaby (first granddaughter) but she has only been to an ultrasound once in her whole life. She has three daughters and only got a scan with me when she was about three months along. Not only was that years ago but the technology was not nearly as advanced as it is today. I’m happy she came because she LOVED it! She loved being able to see her granddaughter moving around and she liked seeing all her body parts from the head to the arms to the toes! 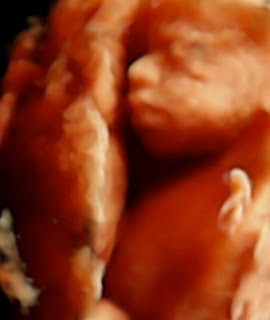 My mom thought it was amazing to see how advanced things have come and how “baby-like” her granddaughter looks already. I gave her some of the pictures we got and she has them on her fridge; she is still talking about how cool it was! 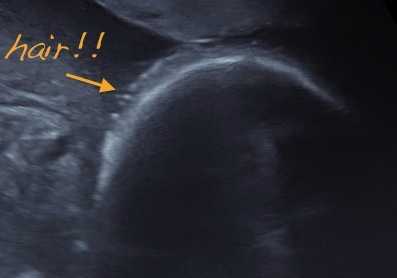 One really funny thing this week is that our baby girl hit herself in the face! I being a mom of course felt bad for her but Jon said it happens all the time. He said he sees it often and that he has scanned twins in the past and they’ve “hit” and “punch” each other before! I thought that was funny because I’m sure it happens all the time, it’s just something I never really thought of. Hello again, they say time flies when your having fun. I'm not sure how much "mom" agrees with that, but I can't believe how quickly this process is going. Last week baby was in a transitional position, this week baby was laying pretty flat and we got some great shots. I'm gonna write less this week and post more pics. :-) Enjoy! 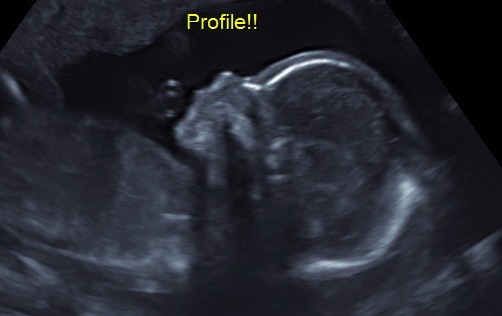 I wasn't super happy with the last gender shot, this one was perfect! I was so happy that our baby girl was in a better position than last time, she was lying flat and Jon got some amazing pictures! 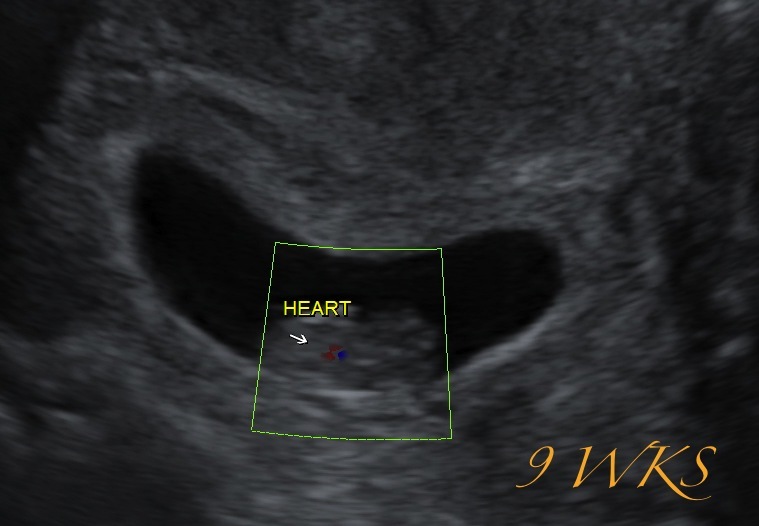 The first picture is of her heart which again is getting bigger and stronger it seems! She was moving around a lot and it was so great to see images of her beautiful face! I was shocked to see we could already see her nose, checks, chin; almost every feature on her face. When we first started she even rubbed her eyes a little like she was sleepy, it was so cool to see! I feel like she is starting to look a lot more like a baby now. On her profile picture, her head seems to have rounded out and it doesn’t seem like its triple the size of her body anymore. To me she looks like a full grown baby yet she still has a lot of growing and developing to do. 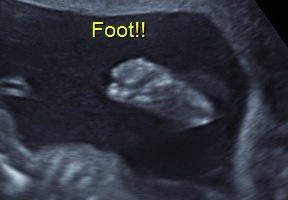 Jon got another shot of her foot which looks bigger than our last foot shot. He alos got a perfect gender shot! I’m amazed at this machine and the images it can capture. I was thrilled we got such great pictures since dad is out of town for work. He was also amazed to see them! It’s hard to imagine how much better each scan is going to get when we’re just about half way there! 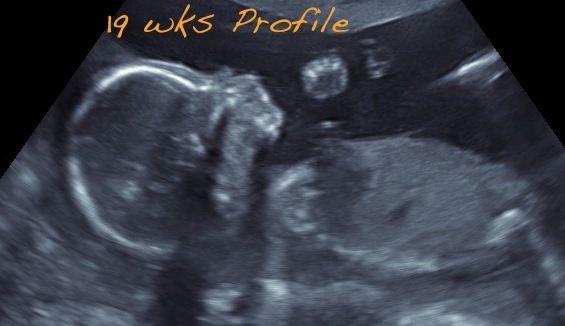 Here we are at 17wks, so....it's about time we reveal gender even though we have had a pretty good idea for awhile. 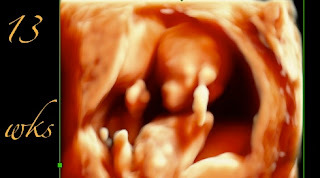 The baby this week was in what I refer to as a transitional position, which means that the head was pointed more up towards moms belly button and the bottom more towards mom's back. It's very common during this period of pregnancy and makes the 3D imaging a little more tricky because the 3D imaging is like a window, so we are looking down from the top. As the baby gets a little bigger it won't be able to sit like that anymore and will be flatter which is better for the 3D/4D stuff. 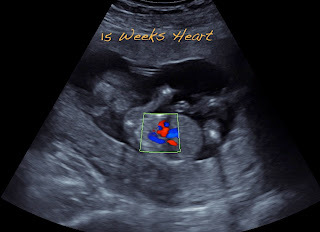 Baby is a little over 5 inches now and around 5.9 oz., the heart rate was 150bpm this week. Just a quick top down 3D picture. Baby made us work for this one, but we certainly have it figured out. I’ve noticed my growing baby bump getting in the way more and more especially when I carry my son or when I read to him. He usually sits on my lap and has started elbowing my tummy and trying to scoot closer to me; it’s really cute and funny! I’ve been telling him that his sister is in my belly and we’ve taught him to give my belly kisses but I doubt he understands at such a young age. 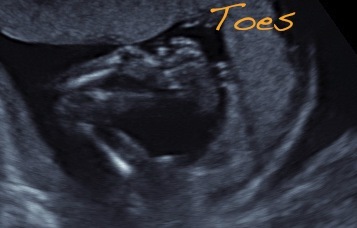 It was so cool to see our baby girl’s toes! During my standard ultrasounds with my son, I’ve never had the chance to see them so this was pretty cool to be able to see with this pregnancy. 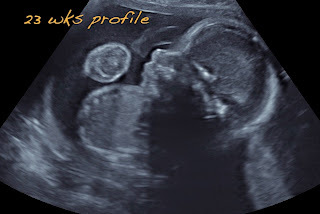 I love that Jon really explains what we’re seeing and some background information on our baby girl’s development too; it really makes the ultrasound that much more fun and exciting! The heart rate was 150bmp which again is getting slower but that’s all normal. 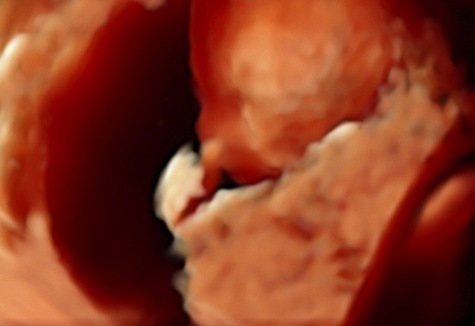 I STILL always look back to our first scan at how small the heart was and it’s crazy how much bigger it’s getting every two weeks and how much more blood it’s bumping. It makes me so happy to see her developing so well! 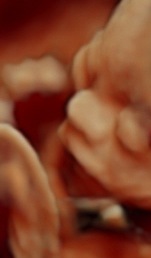 Like Jon said, she is in a transitional position so it did make it difficult to get a good 3D/4D image. 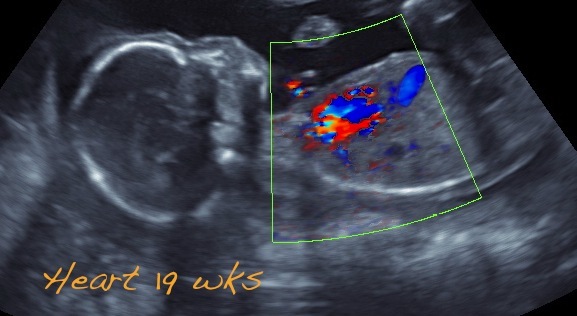 He says it’s normal at this age but I joke with my boyfriend and say that our baby girl is already causing trouble J Hopefully at my next scan she will be laying in a better position; the 3D/4D scans are the best part I think! 15 weeks along now! These two week sessions seem to come up so fast, time is flying by, for me anyway :-). Baby is now about 4inches crown to rump, weighs about 2 1/2 ounces. Some studies say babies will respond to bright light at this point. The heart rate at this time is 153. Thanks for continuing to follow our blog. JT Enlightened Imaging. Wow I can’t believe I’m 15 weeks along already. I think this pregnancy is definitely going by faster than my first. 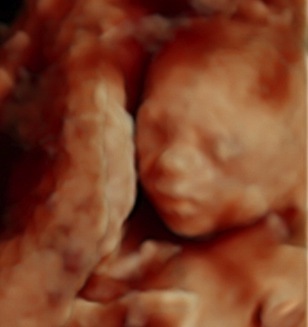 It’s amazing how much more “baby like” our little bean is looking each scan. 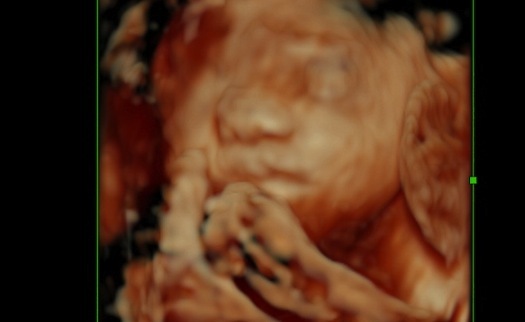 The face, body, fingers, everything; has so much more detail each and every week. I think I finally have all my energy back, thankfully! I’ve also noticed my belly has started to get a little bigger and is getting in the way more and more. When I hold my 13 month old or put him in his crib I really notice the changes in how much bigger it’s getting. The heart rate was 153 bpm this week which is a little lower than last time. It still amazes me to see how much the heart is growing each and every week. I always think back to the first scan when it was so tiny, just the size of a dot from a pen almost. 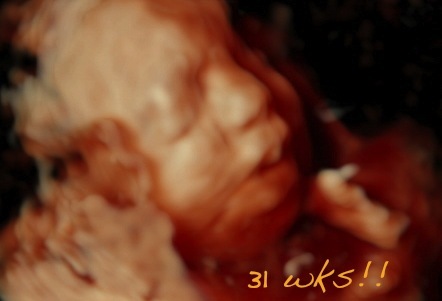 We’re so amazed at how many things have changed again here at 13 weeks! 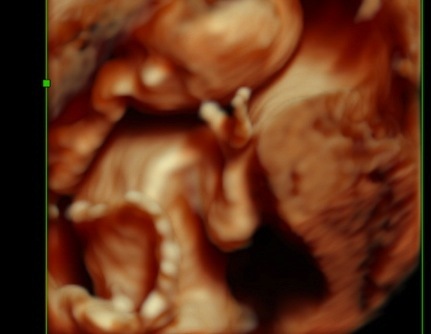 We were actually able to see our little baby’s hands open and close and you could clearly see each individual finger. It’s amazing that all this is taking place still so early in the pregnancy. Our NugBug was moving all around and kicking his/her legs and arms everywhere. It’s amazing to me because I still haven’t felt any movement yet but our little baby is moving around like crazy, constantly! Hopefully since this is my second, I’ll feel the flutters much sooner than last time. The heart rate was 155 bpm which is lower than what it was in the beginning. 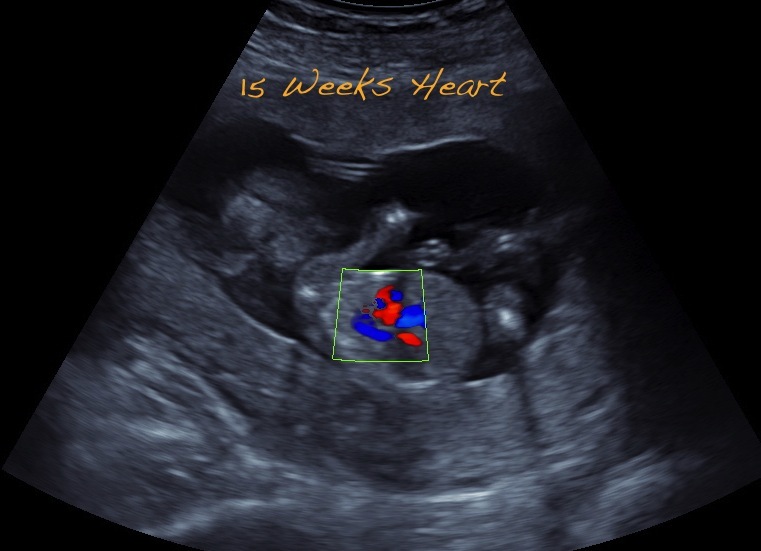 When we had our first scan with Jon the heart rate was 175bpm which I thought was extremely high but Jon says that they usually start our high and will decrease so that is good! You can see in the middle picture how much bigger the heart has grown. I love comparing the first set of pictures from 9 weeks to the most recent ones; it’s so cool to see all the big changes that you normally wouldn’t be able to see this early along. These posts are broken up into two parts each. 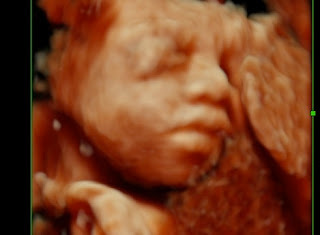 One part from me (Jon Titus of Enlightened 4D Imaging) and the 2nd a comment from the parents of the baby we are following. The baby is now 11ks and what a remarkable change. The baby is now about 1 1/2 inches long. 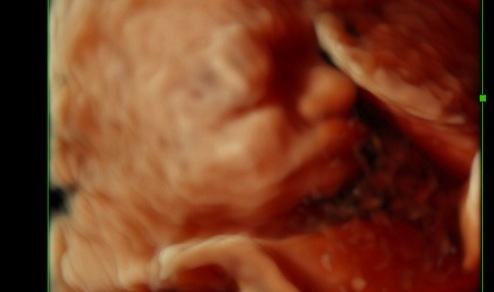 We are able to now see (through ultrasound) a real baby. 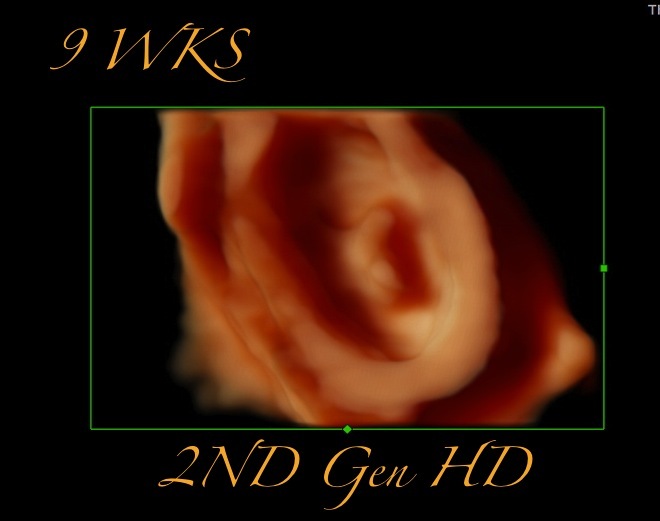 One of the really unique new features of the 2nd Gen HD ultrasound is the ability to utilize an artificial light source. It along with many other advancements result in some stunning images. 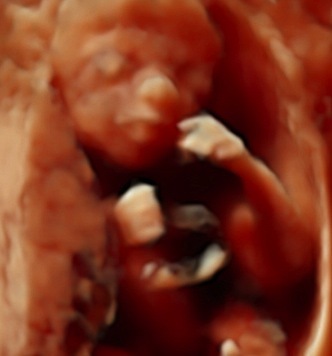 Enjoy....Jon Titus Enlightened 4D Ultrasound. Wow it’s amazing to see how much has changed in just a few short weeks! I can’t stop looking back and forth from our scans from this week and the scans from week 9. Last time we could hardly tell which end the head was and now it’s clearly visible along with arms and legs. Right away when we started we were able to see the heart beating nice and strong. 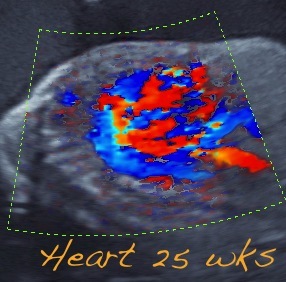 The picture that says heart on it shows the blood pumping in and out, if you look at our scan from last time (week 9), it’s amazing to see how much bigger the heart got in just a few weeks. 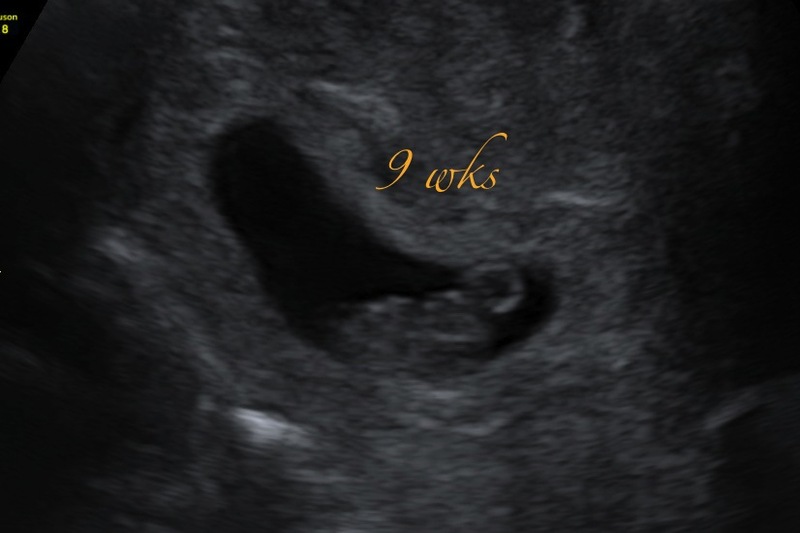 It really makes me proud to see that I am growing such an amazing miracle and I feel that since he/she is growing so big so fast, I must be doing a great job taking care of myself! When Jon first started the ultrasound, our little NugBug was being extremely lazy! 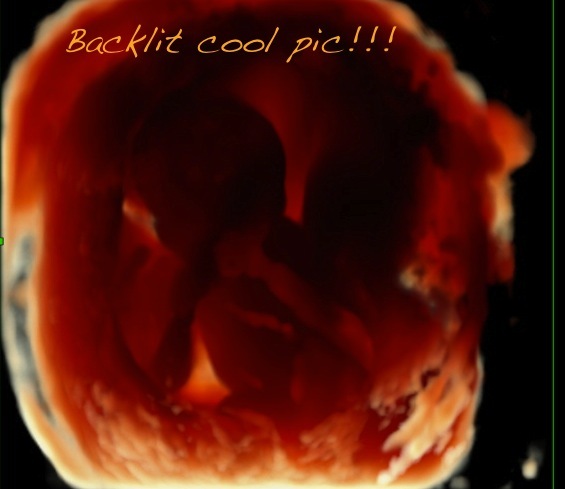 He said that the baby was curled up a little facing towards my back and seemed like he/she did not want to move out of that spot. So he got a lindor truffle from the other room and said that about a minute or so after I eat it, the baby will be moving around more. At first I wasn’t so sure it would work as good as he was saying but sure enough not a minute after eating it, our NugBug was on the go! He/she was moving around all over the place kicking his/her legs and waving his/her arms all over. We were able to get some good shots then and I was happy, I was started to feel sad that our NugBug was so lazy at first but Jon was right, the chocolate worked! He said that they’ve tried regular chocolate before but lindor truffles are the only ones that seem to work. I thought that was funny since some babies usually are pretty high maintenance! 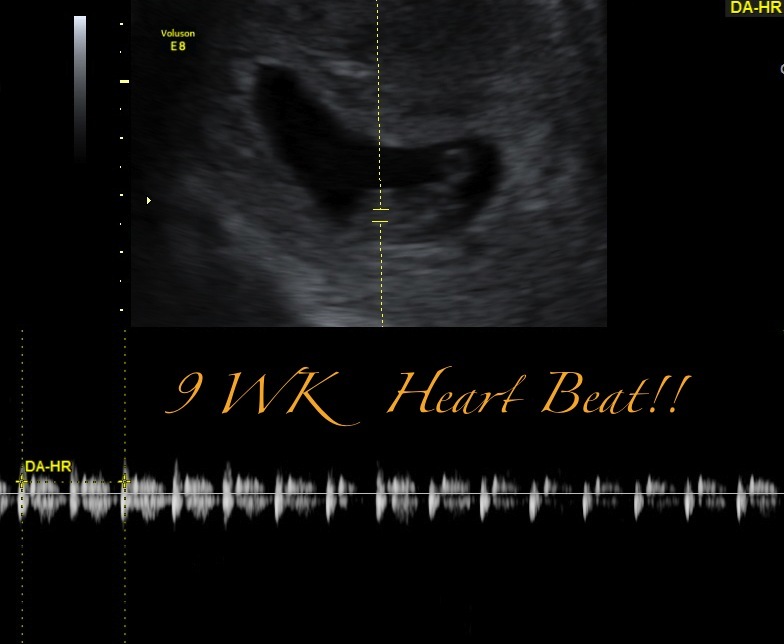 Here is our first installment at 9wks. I'm always telling people that every week is like a year when it comes to fetal development, I think that you all will be amazed to see how true that statement is! I've been doing ultrasounds a long time and am still shocked at what takes place from one week to another. At this stage, the baby is 1-inch in length, about the size of a martini olive and weighs a mere 2 grams—a little less than a penny. Most info. 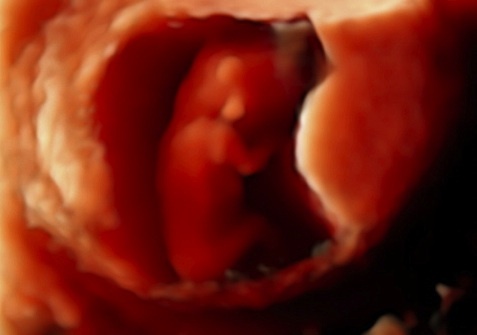 will say that "You might be able to hear the heartbeat now", however, look at what can be visualized already! I'd love hear some other creative baby size comparisons as well so chime in and let's enjoy this miracle! JT Enlightened 4D Imaging. 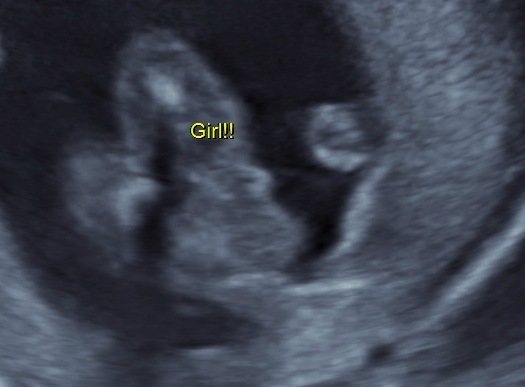 Today was the first day we got to see our little baby! 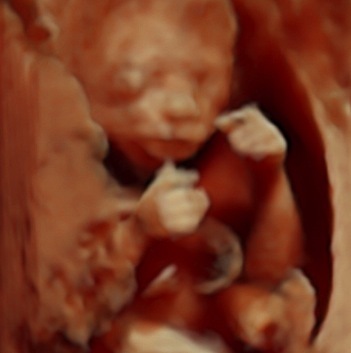 Well, we actually had a scan at my doctor’s office during my first OB appointment but it wasn’t even close to how amazing this scan was. I was six weeks along at the time and the baby just looked like a blob. 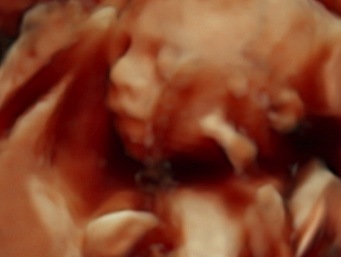 The ultrasound tech said there was a heart beat but she wasn’t able to read it and the whole scan was about three minutes long and I was sent home with your typical ultrasound picture of a blurry blob. It’s amazing to see how many changes happened in just a few short weeks which explains why I’ve been so tired and exhausted lately. This scan was so amazing, we didn’t know what to expect with a new machine and all, I was personally just excited to see my baby again. Not only did I get to see him/her, we got to SEE the heart beat and we got to HEAR the heart beat! It sounded like a horse galloping and it was strong and healthy at 175bpm. We sat and listened to it for a while and my boyfriend said he got goose bumps! He couldn't stop laughing and saying how amazing it was to hear our baby’s heart beat at such an early stage with so much definition. 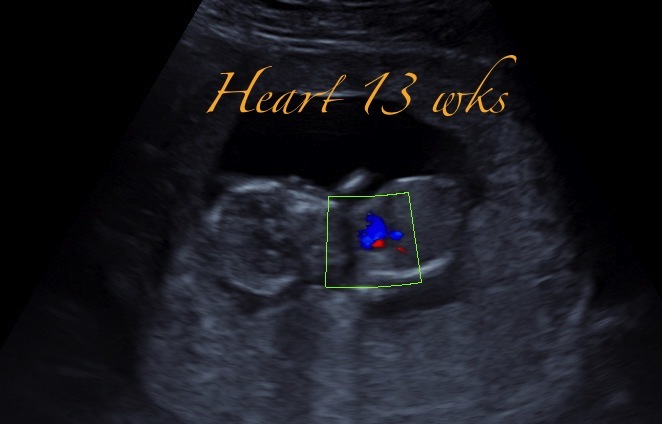 The ultrasound even showed us the blood circulating through the heart. 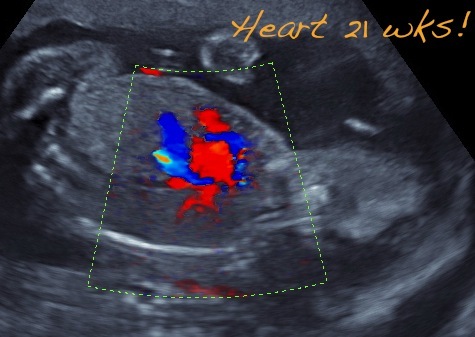 If you look at the picture that says “heart” you can see a blue and red dot in the center of the baby- that is the blood circulating! It makes me so happy to see that our little bean is already functioning like we do at such an early stage. Our little bean was also moving around a little bit. 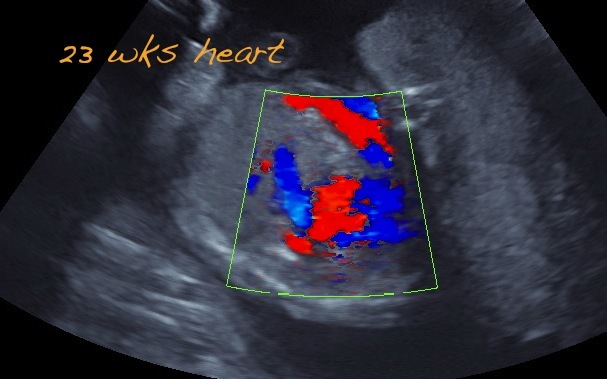 That was super cool for me because I’m not feeling him/her move yet obviously but just to know that he/she is in there with a strong heart beat and moving around a little made me feel so happy and blessed! When the ultrasound was switched over to the 2nd Gen HD I couldn’t believe my eyes. 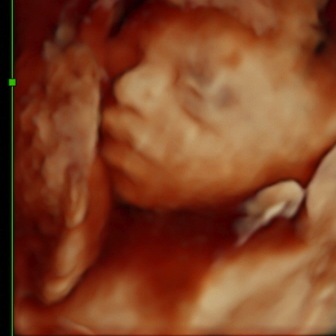 We could actually see our baby, it looked so real! 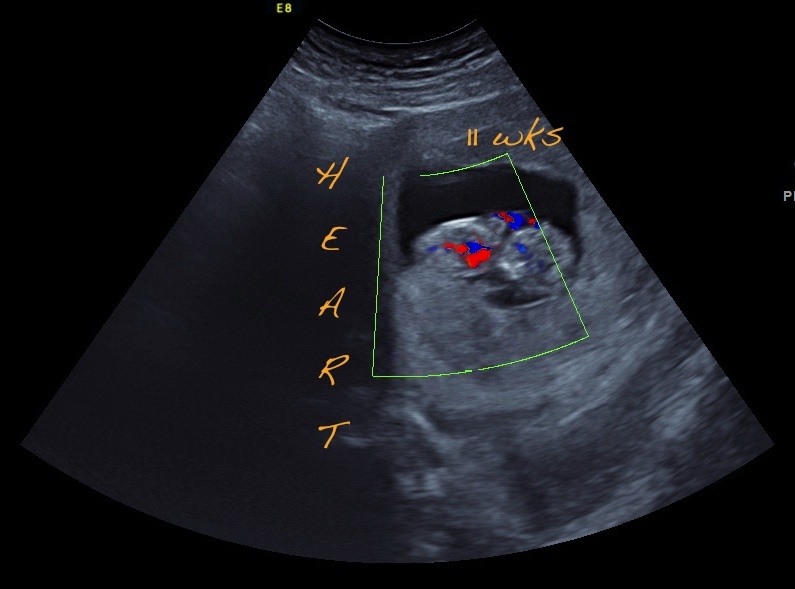 He/she looked like a little nugget, maybe NugBug will be our nick name until we find out the gender, which will hopefully be sooner than usual J If you look at the colored picture above, it’s looks like the uterus is cut in half and you can see the baby in that circle. I think the little baby looks like a bean if you ask me! We’re so excited and can’t wait to watch this baby grow and develop. I hope you all enjoy following along with us on this amazing journey and enjoy learning along the way too!